Pravin Tambe scripted the most remarkable chapter in his brief Twenty20 career, as he scuttled the Chennai Super Kings chase with a canny spell of legspin bowling that reaped 3 wickets for 10 in four overs. Super Kings began poorly in pursuit of 160, failing to eclipse the required rate in the Powerplay, as both openers were run out, but Tambe ensured the dangerous men below would not prosper, as he and the seamers gleaned a wicket per over between the 9th and 13th overs of the innings. At the innings break, Royals may perhaps have felt their 159 for 8 was at least ten runs light at a traditionally high-scoring venue, but despite a desperate R Ashwin salvo towards the finish, the hosts extended their winning streak at home to 13 victories. A fluid Ajinkya Rahane scored 70 from 56 balls, which helped set up the 14-run win, with the Royals finishing the year unbeaten in Jaipur. Tambe extracted no alarming turn from the hard surface, but succeeded instead by pushing his legbreaks through quickly at the batsmen's legs. The Super Kings batsmen were tentative in his first over, and when Badrinath ran past one that kept low in Tambe's next over, the visitors were even more reluctant to take him on . He trapped Dwayne Bravo in front with a slider in the following over, after Rahul Shukla had done MS Dhoni in with a beauty at the other end, then effectively delivered the coup de grace by removing Suresh Raina, who had been the only top order batsman to produce a start. 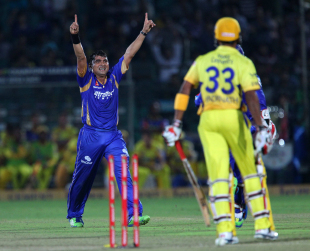 When Tambe began his spell, Super Kings were 41 for 2 after 6 overs, and when he finished, they were 73 for 7 after 13. Ashwin swung bravely at the seam bowlers, whose standards dipped after the middle overs, but his team had already surrendered too much ground. He and Chris Morris got Super Kings to within 23 runs off victory before the 20th over, and although Ashwin struck the first ball for six, he fell on the fourth delivery, having struck three fours and three sixes in his 28-ball 46. Rahane arrived with consecutive fifties behind him, and his abiding fine touch was plain to see in the first over, when he strode down the pitch to send Ravindra Jadeja into the sightscreen. He lay low for several overs after that, as he collected runs into the outfield, but unfurled his attacking strokes again in the company of Shane Watson, with whom he put on 59 for the fourth wicket. The Super Kings attack was disciplined at the finish however. Royals were placed at 141 for 4 at the end of the 17th over, looking set for a score in excess of 170, but could only muster 18 more runs, surrendering three wickets in Dwayne Bravo's final over.